While the health service continues to injure its patients needlessly, paying compensation is necessary. Injured patients also need guidance and representation, particularly at a time when they are at their most vulnerable. 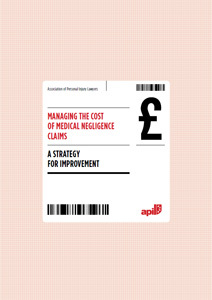 The Government is about to consult on fixing legal costs in medical negligence claims as a way of promoting ‘better litigation’ and reducing the costs in claims. The NHS’s priority should be to look after people, not to save money for itself. But that is not to say that improvements cannot be made for the benefit of our beloved health service, and for its patients. 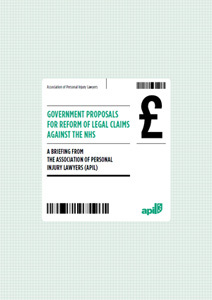 APIL has produced two publications, a strategic paper exploring the options available to the Government and the NHSLA for improving the claim process, and a briefing document which also marks out ways in which the NHS and NHSLA could reform their practices.